What Are the Differences Between the 2018 Chevrolet Sonic and Spark? For drivers who prefer small vehicles, Chevrolet offers not one, but two subcompact cars: the 2018 Sonic and the 2018 Spark. But how do the Sonic and Spark differ? Here’s a look at some of their distinguishing characteristics. While the Sonic and the Spark are both small, the Sonic is bigger. It’s about 6 inches wider and 30 inches longer than the Spark. Inside, the Sonic offers a bit more leg room, shoulder room, and hip room for both front and rear passengers. While the Sonic is available as a four-door sedan and a five-door hatchback, the Spark is only available as a hatch. In the hatch configuration, the Sonic provides nearly 48 cubic feet of cargo volume with the rear seat down, while the Spark offers about 27 cubic feet. The Sonic’s two engine options are both more powerful and responsive than the Spark’s single offering. The Sonic’s 1.8-liter four-cylinder EcoTec puts out 138 horsepower and 125 lb-ft of torque, while the available 1.4-liter EcoTec turbo engine delivers the same horsepower but nudges torque up to 148 lb-ft. Meanwhile, the Spark’s 1.4-liter four-cylinder EcoTec engine puts out 98 horsepower and 94 lb-ft of torque. You’d expect both of these cars to offer solid fuel economy, and they do. The Sonic’s base engine achieves a combined EPA-estimated 28-29 mpg, depending on transmission and body configuration. With the 1.4-liter engine, it gets a combined 30-32 mpg. The Spark does slightly better in this department, delivering a combined 33 mpg. The Spark and the Sonic both offer a solid array of features. 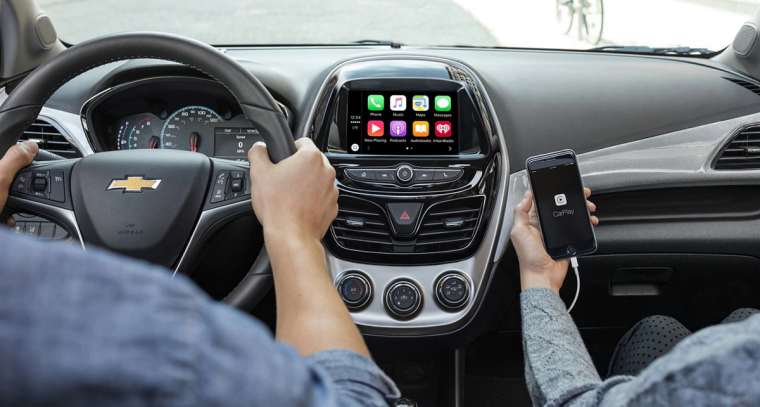 Included in each vehicle is a standard Chevrolet MyLink infotainment system with Apple CarPlay and Android Auto compatibility, along with OnStar 4G LTE and built-in Wi-Fi. If you’d like to customize your ride, the Sonic offers the RS Package that’s not available for the Spark. On the safety front, both cars offer a standard rear vision camera and complimentary OnStar service. Active safety features like Forward Collision Alert, Lane Departure Warning, and Rear Park Assist are available for both, but the Sonic offers them as a package on more trims than the Spark. A new Sonic will cost you at least $2,000 more than a Spark. The MSRP for the Sonic ranges from $16,170 for the base trim to $22,195 for the Premier hatch. The Spark starts with a $14,095 MSRP for the base trim and goes up to $18,595 for the 2LT. Conclusion: Both of these cars offer solid features, strong fuel economy, and affordable pricing. If you need a car primarily for low-speed city driving, the Spark’s size and slightly superior efficiency make it a great choice. However, if you regularly venture out onto the highway, want a car with a little more get-up-and-go, or need more room for passengers and cargo, consider the Sonic instead.